I am quite fascinated by scraps at the moment. If you are a reader of my Sonia Knits blog, you will know I’ve once again hauled out my 20 year hexagon quilt. It is made up of bits and pieces of everything and a lot of fabric from Spotlight and Lincraft from 20 years ago. Being a sock knitter with lots of little left overs, I’ve become obsessed with the idea of knitting Frankenstein socks. That is socks made from left-over sock yarns. At this point it’s just an idea, don’t get excited. I’ve seen stunning examples by Spilly Jane, who sometimes sells her creations. So I’m going to continue to knit socks and gather up my left-overs until my collection inspires me to put it all together. There will be no hexi-puffs or sock blankets here! I’ve had a lovely week of Staycation which allowed me to pull out my spinning wheel. But before I could begin, I had a number of bobbins with substantial amounts of ‘left-over’ single spun fibre. The easiest way to deal with all these leftovers was to ply them together. I broke all the rules, mixing merino/silk singles with much coarser fibre singles. Heck, I can’t even remember what all the fibres were. But the result, to me was stunning. Interesting. Hey, maybe scrap projects are it. Somehow they hold more meaning, more history. Whilst I still hold grave fears for ever finishing my hexagon patchwork quilt, I’m just itching to start some scrap socks. I don’t manage to keep many of my New Year resolutions. In 2013 I decided to see one movie a month at the cinema. Didn’t manage to see anything other than two movies on a long haul flight! I have tried to commit to trying new knitting things and this year was a foray into stranded knitting. Before anyone gets too excited, we are not talking about the intricate patterns of some of my fellow Richmond Knitters (do I still qualify even though I haven’t been in ages?). We are talking about managing two colours at the same time without ending up with an unholy knotted mess! 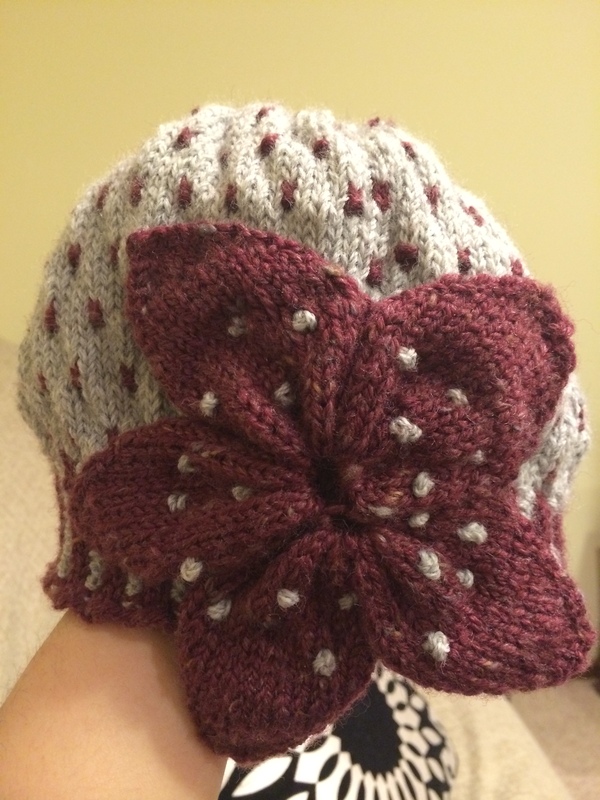 A friend of mine was recently diagnosed with breast cancer and going through chemo so I thought what better than a hat for the upcoming winter! 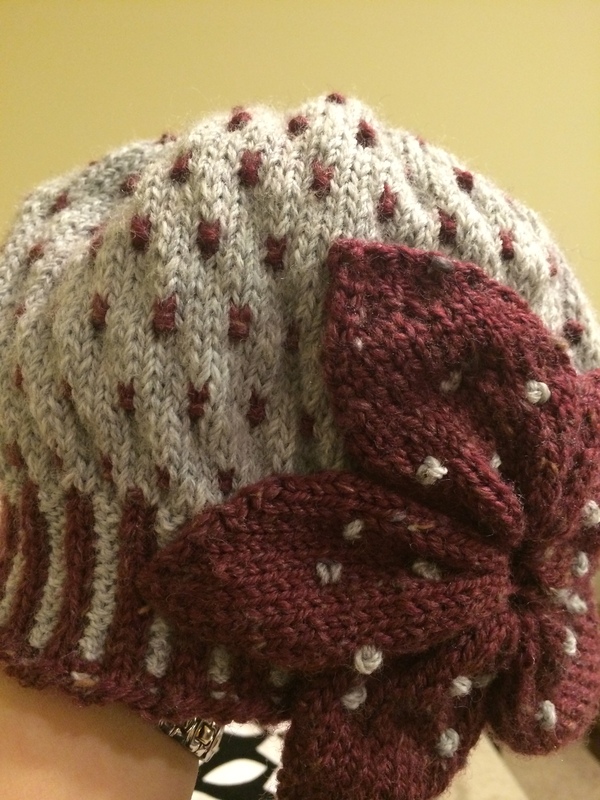 I decided on the ‘Cloche Enough’ Hat by Susan Ann on Ravelry. It is a great pattern and the end result is far more impressive. The flower embellishment really makes all the difference. While I made a few modifications in terms of needle size, I was fairly faithful to the pattern and am thrilled with the result.